This is plate 17 from 'Sketches in Afghaunistan' by James Atkinson, a medical officer with the British forces during the first Anglo-Afghan war (1839-42). Wanting to control Afghanistan and use it as a buffer against Russian expansion into India, the British needed to depose the Emir, Dost Mohammad, and replace him with a pro-British ruler. This image shows Bamiyam, the village to which Dost Mohammed and his followers had retreated. 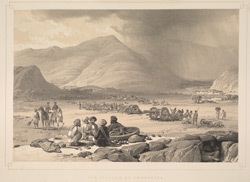 Atkinson wrote: "To the extreme right of the drawing, at the foot of an immense mountain is the village, and across the valley are ranged the guns, twenty-five in number, of Dost Mahommed Khan, which were abandoned the night previously and afterwards secured by Major Cureton, who had been sent with his Lancers to take them." Two hundred gun-bullocks were also abandoned and became prized property. Atkinson continued: "upon inspection it was found that each gun was loaded with three balls, so that the danger to the gunner would have been greater than to the enemy."